Was 2015 business as usual? Yes – and hardly. If the business of mainline steam can be summed up in the safe and enjoyable experiences of several thousand men, women and families behind our living time machine, then the 765 punched the clock. While the 765 and her crew have experienced long hauls and lengthy trips, something about 2015 felt much like a marathon. This year presented strong returns, but also carried with it the most consistent challenges. With an uptick in trips and increased frequency of operations, the challenges behind ticket sales, car hosting, trip logistics, passenger car rental were tripled. As the holiday season approaches, let’s revisit some highlights and press coverage from 2015, count our blessings, and look forward to a new year. For more, see the combined Summer & Winter Edition of our quarterly member newsletter, Short Lines. Still, people from around the world have previously signed up to ride the train. The Fort Wayne-to-Lafayette excursion in 2013, the first steam-driven passenger departure from the Summit City in 20 years, sold out in less than two hours, Lynch recalled. To York, the experience on the Pullman car is worth the money. The car has overstuffed chairs and sofas, wooden, white-tablecloth dining tables and not a speck of plastic throughout, he said. Its 24 passengers will enjoy hors d’oeuvres and brunch-style sweet treats during the trip. The train stops for an off-board lunch in Lafayette. “We try to deliver an authentic 1930s-’40s luxury passenger train experience,” York said. National Railroad Historical Society volunteer board member Kevin Tankersley said the Dover Harbor is usually parked in a yard in Jessup, Maryland. The car is in demand for private rolling gatherings as part of contemporary Amtrak trains, said Tankersley, Dover Harbor’s charter agent and manager. “But, we do like to take it out and show it off” with other historical equipment, he said. “My cousin said, ‘We’ll be rolling through Swanton between 10 and 12.’ My children have been so patient,” Ms. Mishka said as the train’s headlight appeared in the distance around 1:45 p.m. “We were here early, but I’m glad we waited,” she added after it passed. “I liked that he waved at us!” Ella exclaimed. But for Stryker resident Rita Kruse, the steam train’s 1 p.m. passage was just a pleasant surprise. “Hundreds of trains go through here every day. It’s interesting to see a little bit of history,” said Mrs. Kruse, 67, who had heard the steam whistle in the distance and stepped out in front of her South Depot Street home to watch the special go by. When Marion Sparks of East Toledo heard the steam engine’s whistle blowing from the downtown side of the Maumee River, she hustled her 93-year-old uncle, Bob Lober of Oregon, into her car and drove him to the bridge on Miami just in time to see it. An hour long podcast aboard a 765 excursion. Sean Moore closed his small computer shop as soon as he heard the Nickel Plate Road 765, a historic steam locomotive, was set to pass by Dunkirk on its way to Buffalo.He jumped into his van and found a spot to catch a glimpse of the engine. Joined by other train enthusiasts, Moore waited nearly four hours in the scorching sun Monday before the train passed. The thrill lasted for all of 30 seconds. “We looked at each other and there was not much spoken. We were just in awe,” Moore said. The 765, built in 1944 by the Lima Locomotive Co. for the Nickel Plate Railroad, made its way to Buffalo for the first time in 20 years. The engine, which once pulled freight and passenger cars, now runs excursion routes for the Fort Wayne (Ind.) Railroad Historical Society. Excursions from Cheektowaga to Corning are set for Saturday and Sunday. With its 20 passenger cars and 5-feet-tall drive wheels, the 765 looks mighty. The engine also engages the ears with its loud whistle and captures the nose with its smell of coal smoke. “You can hear it pant and breathe,” he said of the machine built to pull 70 cars at 75 miles an hour. The 765 evokes a similar feeling in Jason Sobczynski, 36, who operates the train. He’s made 16 trips with the 404-ton engine, logging more than 6,000 miles. “It’s unlike anything anybody has seen unless they’ve already seen one of these,” said Sobczynski in the train’s cab. The summer heat and steam pushed the temperature in the cab to 100 degrees Wednesday afternoon. The train helps keep history alive, he said. 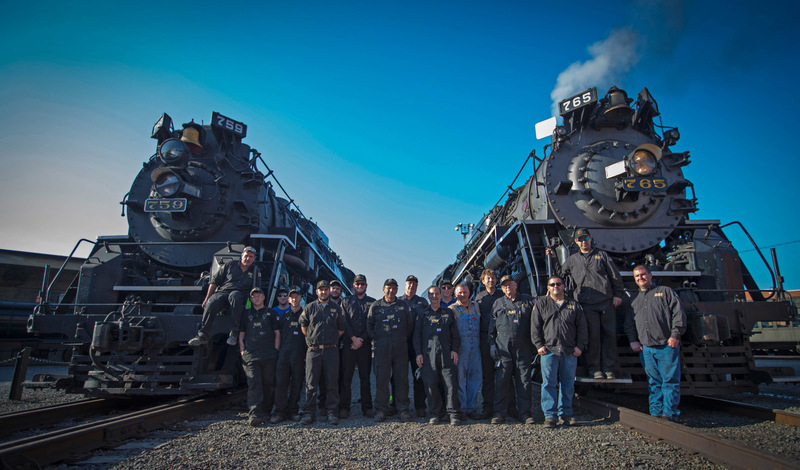 Train lovers gathered in Buffalo for the historic running of steam locomotive number 765. Gavin has cystic fibrosis and a heart defect. His parents, Jason and Christie, say the condition is so rare, they’ve had to travel all over the country for treatment. What gets Gavin through countless hospital visits and a strict daily routine? Trains! That’s how the family met filmmaker Drayton Blackgrove. He produces railway videos and was in Buffalo with the Steel family this weekend for the historic running of steam locomotive number 765. Aboard the locomotive they both adore, stationed in the heart of Scranton, two Ohio lovers vowed their lives to one another. In attire more common 65 years ago, Christiaan Beatty and Jessica Coleman said “I do” on Sunday aboard the Nickel Plate Road No. 765 steam locomotive during Railfest 2015 at the Steamtown National Historic Site. Both of Cleveland, the two are volunteers with the Fort Wayne Railroad Historical Society, which brought the No. 765 to Scranton for the weekend. Before deciding to have their wedding away from home, they had been studying the path of the passenger train named Phoebe Snow, which frequented Scranton, when the new Mrs. Beatty proposed a novel idea. “She said ‘We should get married on a train,’” Beatty said, his arm tucked behind his bride. As hundreds of Railfest-goers meandered through the sprawling museum, a dozen or so historical society members swarmed around the couple snapping photos and offering congratulations. Lynch said next year’s excursion season is already in the planning stages, with a trip west not out of the question. Only twice in the last four years has the 765 traveled west, with trips to the Quad Cities in 2011 and St. Louis in 2012. The 765 is expected to undergo a government-mandated inspection that is required every 1,400 days of operation or 15 years, whichever comes first. While not yet due, the Fort Wayne Railroad Historical Society may use the winter to do half of the inspection work and repairs to avoid significant downtime during the peak season. Lynch said the organization has $250,000 in the bank set aside for this scheduled maintenance.